Finding myself with a couple of bags of bargain kale recently I made this Butternut Squash and Kale Soup as well as well as some experimental kale crisps (a work in progress) which I used as a garnish! This is my second soup using kale and I have to say it worked really well blended with butternut squash which as a sweet vegetable counteracts the more bitter kale. My family loved this soup so this is definitely one I’ll be making again. As we head into summer I like to serve soup in the evenings with a spread of cold food; as you can prepare the soup in advance it makes life much easier. 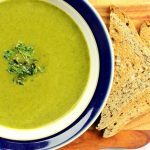 It’s also a great way of ensuring your kids are eating enough vegetables as they might turn their nose up at a pile of kale on their plate but blended into a soup it makes it far more palatable. A simple and nutritious butternut squash and kale soup that the whole family will love. Add the onion, garlic and butternut squash then sweat under a lid for 10 minutes, stirring occasionally (until onions softened). Add the kale and wilt under the lid for about 5 minutes. Add the vegetable stock and ground pepper bring to the boil, then lower the heat and simmer for 20 minutes. Blend soup until smooth, adjust seasoning if necessary. Garnish with kale crisps (if using) and serve with crusty bread. 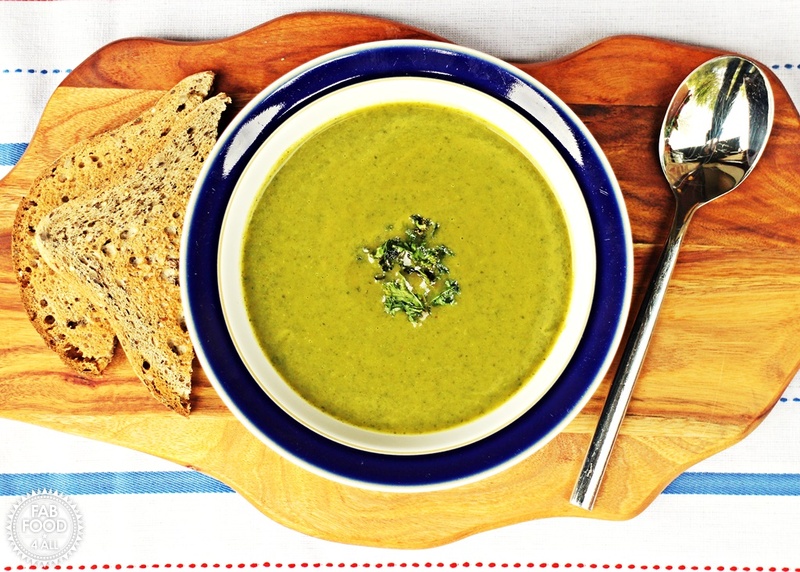 You might like to try this lush Kale Soup too which has a carrot base! As this soup was made with a 1 p bag of kale I am entering it into Credit Crunch Munch which I run with Fuss Free Flavours and is this month hosted by Utterly Scrummy Food for Families.